Sean O’Rourke is celebrating the biggest win in the latest JNLR radio listenership ratings survey. 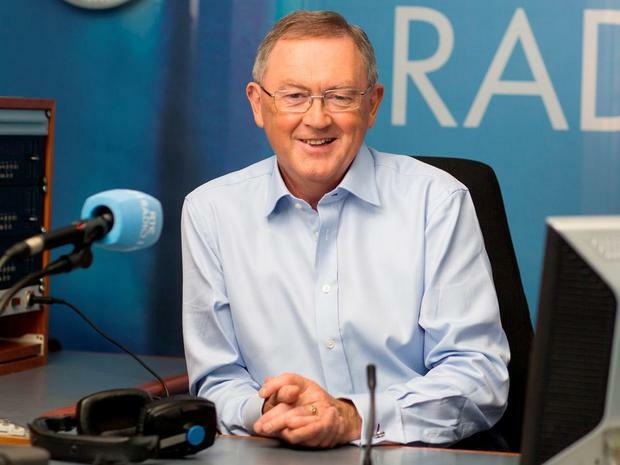 O’Rourke’s two hour mid-morning show on RTE Radio 1 on weekdays piled on 22,000 more listeners this month, rising to 354,000, compared with the February ratings survey. It's the first time a presenter in that slot has hit more than 350,000 listeners in the past 15 years since Newstalk came on the scene, according to head of RTE Radio 1 Tom McGuire. “It’s a brilliant performance. Sean is a wonderful broadcaster," said McGuire. "We’re getting a younger audience coming into his programme because they will hear Sean doing stuff related to family and education, as well as music and sport and books." Over at Newstalk, Sean Moncrieff is also toasting a healthy increase in his listener numbers. Moncrieff's daily afternoon show has gained 11,000, bringing his total to 76,000 listeners. His station colleagues Pat Kenny and George Hook made smaller gains, with 1,000 and 2,000 new listeners respectively. Speaking about the latest JNLR figures, Patricia Monahan of Newstalk, said: “We are very pleased with our performance and the great progress made since the new schedule was put in place late last year. “It will not be possible to see a proper comparison until the JNLR figures are released in October as the new schedule means new times for shows, as well as different durations, and the addition of new programmes. There were also increases at Today FM, meanwhile, where Dermot & Dave, who moved to mid mornings (9am-12am) in January 2017 gained 12,000 new listeners for a new figure of 176,000 in that slot. Also, Al Porter's new show from 12.30-2.30 (Dermot and Dave's previous slot) also saw an increase of 7,000 to 122,000. Good news too for Fergal D'Arcy who gained 10,000 listeners, bringing his audience to 113,000 for the 2.30-4.30pm timeslot, Louise Duffy who gained 10,000 for a new total of 113,000, and Paula McSweeney whose early morning show is up 3,000. The Last Word with Matt Cooper, however, has seen a drop of 2,000 to 130,000, another blow following a drop of 4,000 in February. The last three months has also been a period of recovery for several of RTE Radio 1's shows since the last book. Marian Finucane’s Sunday Show on Radio 1 has won 28,000 new listeners, giving her a new total of 336,000 individuals tuning in on Sunday mornings. Her Saturday show has seen a more modest bump of 10,000 to push her total to 382,000 listeners. She has bounced back from drops of 15,000 and 14,000 on Saturday and Sunday respectively in February. "Numbers go up and down," she told Independent.ie. "Of course it's always nice to go up. It's particularly pleasing that weekend programmes in general have done so well." Similarly, Joe Duffy's Liveline had dropped 8,000 in February but has drawn back 7,000 on this book. At the weekend Claire Byrne and Miriam O'Callaghan have also recovered from decreases on the last book. In February O'Callaghan had lost 9,000 listeners but gained an increase of 11,000 this month. Byrne, meanwhile, was down 9,000 and has clawed back 8,000. Flagship morning programme, Morning Ireland, was the only casualty in the latest survey, losing 7000. However, with an impressive audience of 441,000 it is still the biggest radio show in the country. It seems 13,000 is lucky for some as both Ray D'Arcy in the afternoons and Ryan Tubridy mid morning have seen increases by that figure. Tubridy is now drawing an audience of 336,000. Over on 2FM, the Breakfast Republic team was also celebrating 13,000 new listeners and the welcome news that the show hit 167,000 - the exact same number of listeners as the esteemed Ian Dempsey on Today FM, whose listenership remains steady since the last book. 2FM’s Nicky Byrne garnered 8,000 more listeners for a new total of 139,000 while Tracey Clifford scored 6,000 new listeners to bring audience levels to 119,000 and Eoghan McDermott saw an increase of 3,000. He said it was over two years since a conscious move was made to go after a younger audience. The new policy meant 2FM lost its older listeners and figures were declining but now it has enjoyed back-to-back listenership growth. The big increase in the Breakfast Republic listenership was particularly satisfying and it had the biggest listenership in Ireland for people aged 15 to 34, he said. He was delighted that former Westlife’s Nicky Byrne enjoyed significant audience growth and he attributed it to talent and hard work. “He’s a guy who probably doesn’t have to work, I assume, but he comes in with a massive work ethic,” he said. He praised Nicky’s fellow broadcaster on the show Jenny Greene and how both worked so well together since she joined him. “She didn’t like Westlife, she didn’t fancy him, so you’ve got a really interesting kind of chemistry there,” he quipped.